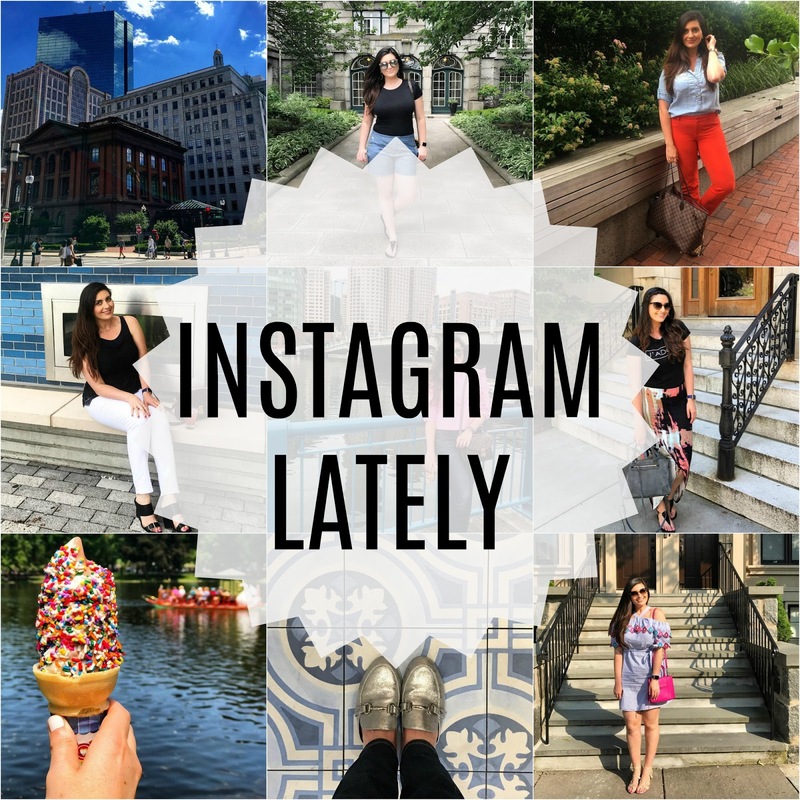 I don't really do too many blog posts highlighting what I'm wearing, but I do post quite often on Instagram! I shared a few of my Instagram looks a few months ago & wanted to do another one before summer comes to an end! I'm going to miss all the bright colors, but I'll be ready for fall tones, especially with my nails in the next few weeks! 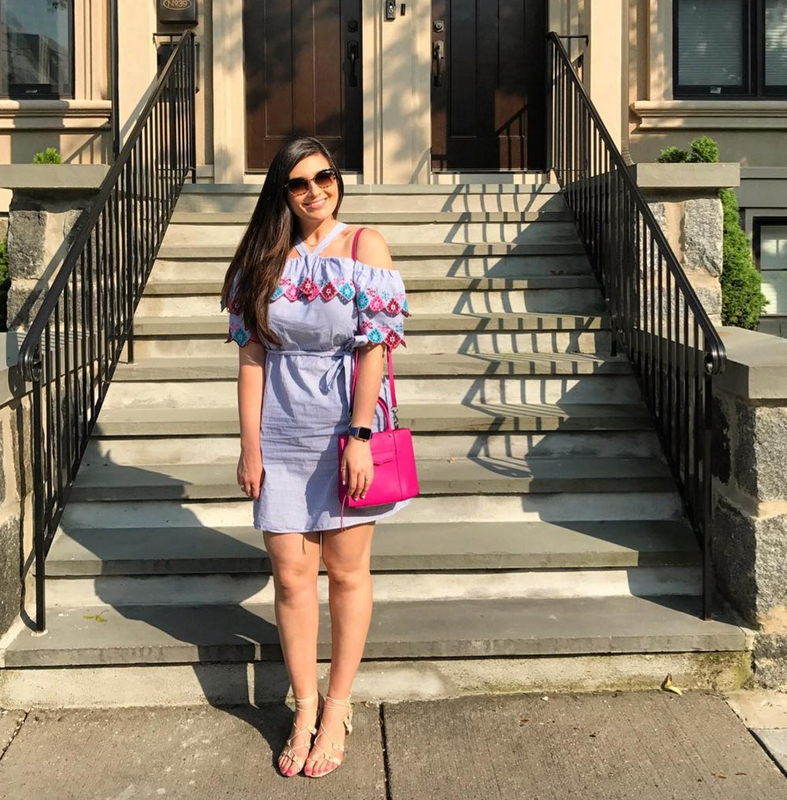 Loft Dress (extra 40% off) || Rebecca Minkoff Mini MAB (different color) || Kate Spade Sunnies || BCBG Sandals (only $20) I tried a new hairstyle with a side braid & reworked some of my older pieces in my wardrobe! 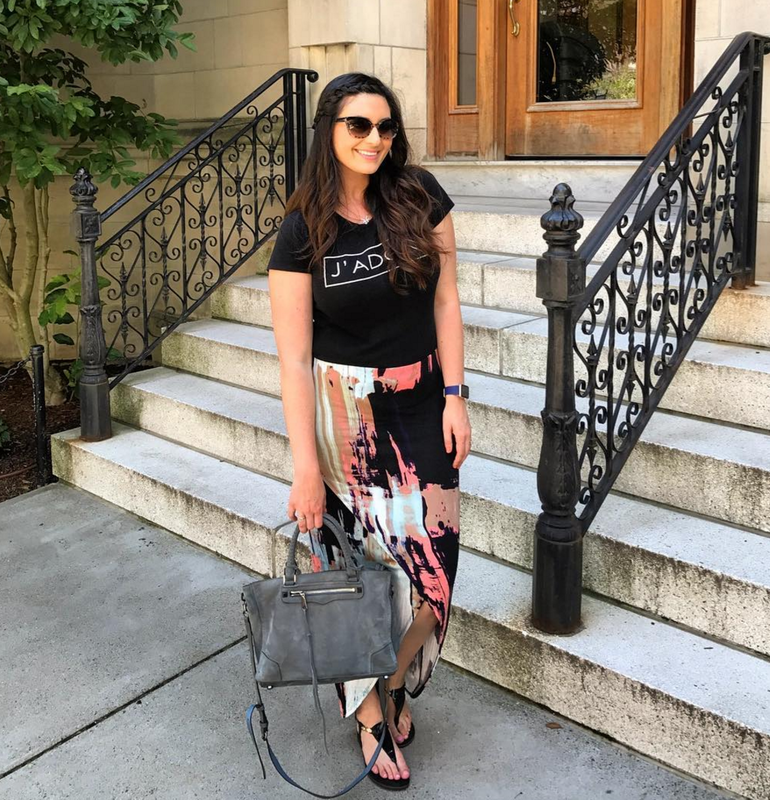 Graphic Tee || Hi/Low Skirt old (Similar) || Regan Satchel I'm pretty sure I wear my chambray shirt year round - I don't know why I waited so long to get one! From this past weekend before we went out for a date night! 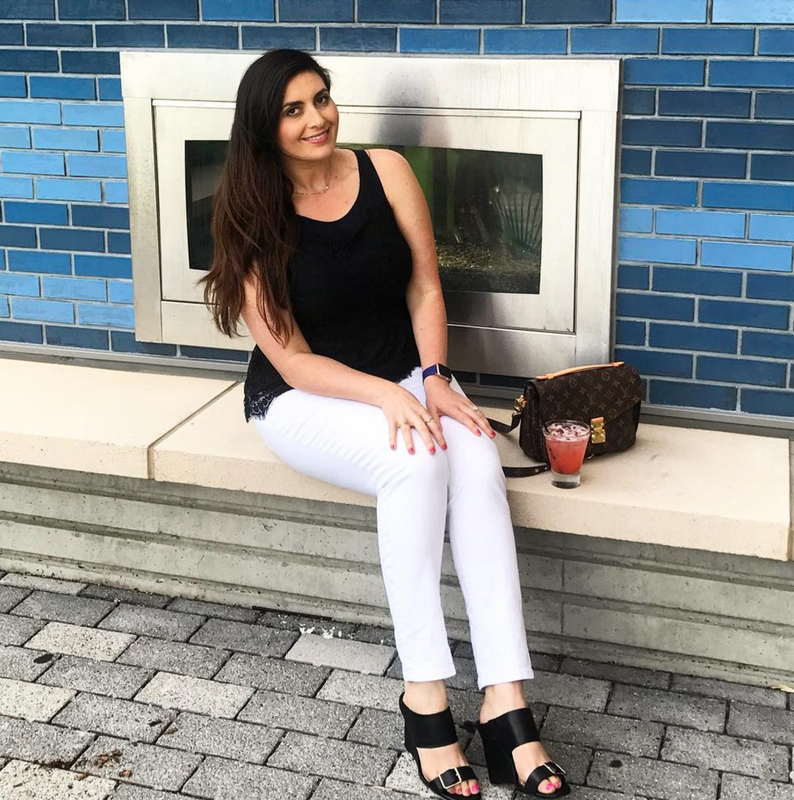 These are without a doubt the best white denim jeans I've ever worn! Currently $25 off! 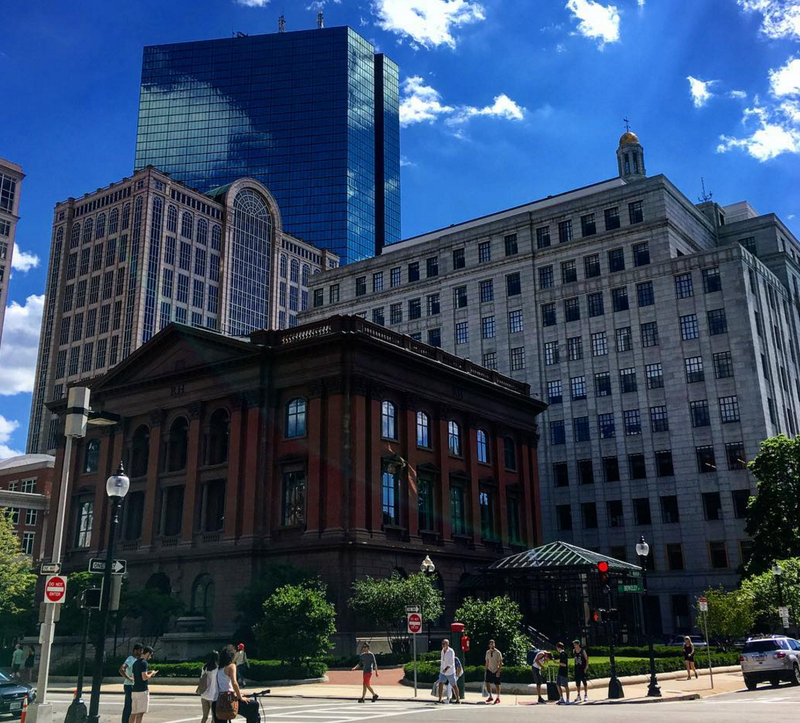 One of my favorite corners in the city - Newbury & Berkley Street right next to the gorgeous Restoration Hardware. You can't really see in my photos, but I've been wearing this necklace every single day since my mom bought it for me - she got me the rose gold version. Are you ready for fall fashion or are you hanging on to summer for as long as possible? You always look so great! Your outfits are on point. I still love how good pink looks on you! And I'm so ready for fall fashion! You are soooo beautiful! Such classy style with fun little detail twists, I LOVE it!! I am so lusting after your purse - it is just so cute!!! And seems like the perfect size. LOVE that necklace your mom got you. I have a ring set that is similar - I need to start wearing them again! You and I are on the same page- I'm working on the same post for tomorrow :) you have such cute style friend and I love seeing your adorable outfits! I really love the side braid one's whole look! So pretty :-) See you tomorrow girl!! You should definitely wear that side braid more often! It's such a cute hairstyle, especially with your pretty long hair. I am seriously loving all of these outfits Biana! That ice cream cone looks amazing!! I'm not ready for cooler weather but I am looking forward to wearing my fall clothes. I'm loving all of your outfits! That necklace is beautiful! Truth is I'm ready for Fall clothing ! When the boys start football practice I want to sit and sip on a pumpkin spice latte and wear a chunky sweater :) Call me crazy but it's my favorite time of year. Have a wonderful day Biana ! Your Insta outfits have just been too cute for words! I LOVE following along! 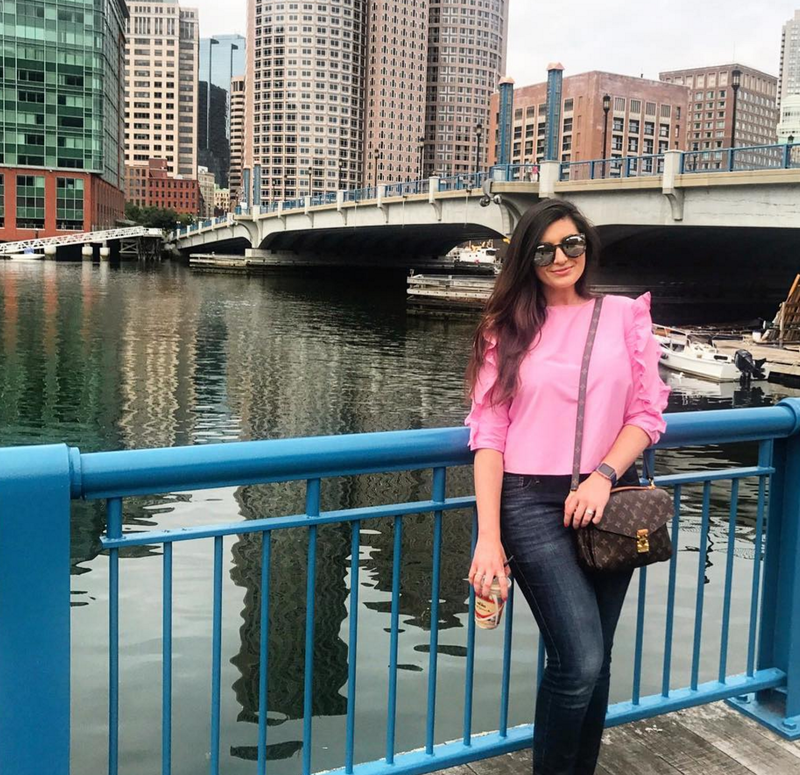 Obsessed with that pink ruffle sleeved top!! You are so adorable, love every outfit! I'm SO ready for Fall, give me all of the cooler weather! um give me all the fall! and seriously that necklace is so so cute. i would totally rock that. and those white jeans, i have a pair that fit so well and it's great when you can find some that just fit so well. great roundup girl! Such a great Instagram round-up! Orange and leopard are one of my favorite combinations together and I love these pants! Perfect for work! Your IG's lately have been so pretty! I especially love that first dress and that ice cream cone looks delicious! I love this! Your pictures are so pretty, as are you! I love the ice cream cone with sprinkles! Mine melted that day too haha. You cutie! Love when you do an outfit post! I'm obsessed with the baby pink ruffle top, can't wait to see you tomorrow! I just love your Instagram account, girl - it's so pretty and cohesive. I still can't get over that pink ruffle sweater, it's such a good color on you! I love all of your outfits. Those sailor shorts are so cute! I just love those silver mules!!!!! Lovely as always! I've got to try some mules soon. Love this round up!! 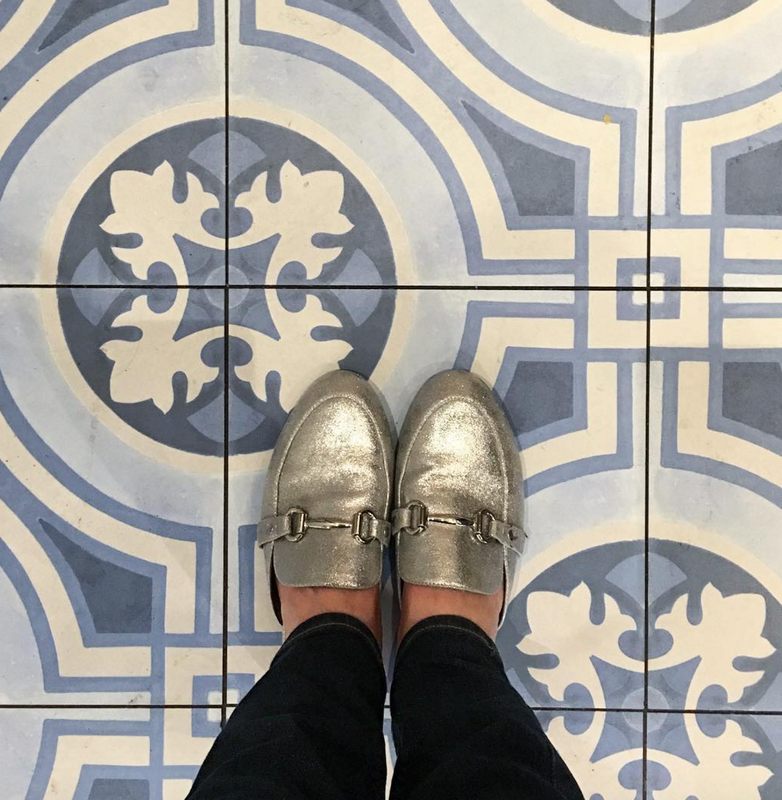 Dying over those silver mules too! I'm obsessed with that pretty high-low skirt and your hair in that side braid, so gorgeous! 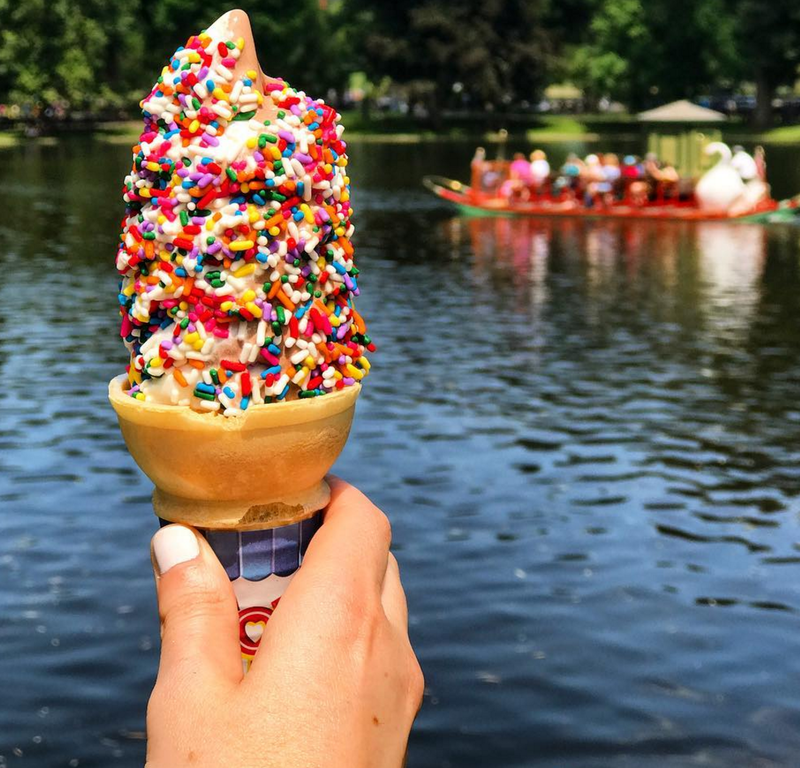 That ice cream covered in sprinkles looks SO good. I wish I didn't love ice cream so much! Girl, you've been killing it with the outfits lately! 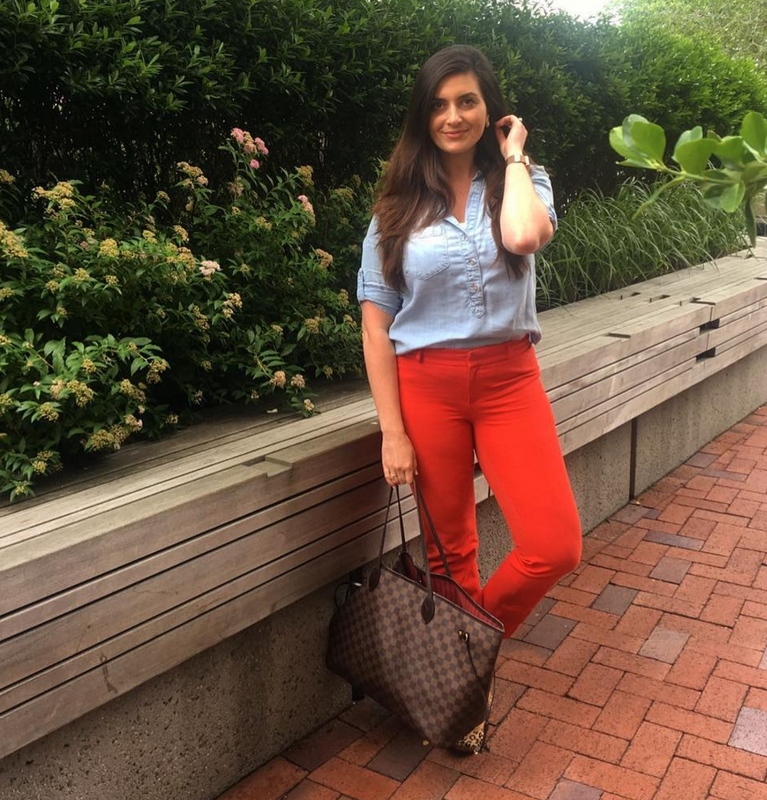 I especially love the chambray with the red pants! I really need to do more OOTD posts on my blog and IG. I just can't fit the time in to do photoshoots and don't think of doing quick ones often with my phone. I need to step it up and do more fashion stuff. You have so many cute outfits! I love those sailor shorts. So many adorable outfits! Im swooning over that embroidered off the shoulder dress! So ready for sweaters and boots and YESSS fall nail colors!!! So cool that there's a Primark in Boston! Loveeee that necklace!! It's such a good everyday piece. That first dress...I am obsessed!! loving your style! super cute outfits! The graphic tee. I want the ice cream cone. I love the print on that hi/low skirt. You always look so classy, Biana! Love all of your outfits! I think you need to post more outfits because you have great taste! Especially loving that first dress. Looking so cute! Love the haircut! So many cute outfits! Love that pink ruffle top! I love that your style is a mix of bright and more monotone piece! My favorite is the first blue dress! Your outfits are always so fabulous, B! Love the pink top! Loving all of your outfits!!! So cute!! And that ice cream looks amazing!! Have a great weekend! Such a fun round up girl! I love your embroidered dress. Hope you're having a great weekend! So many cute outfits lately. Is that the J'dore shirt like the one in SATC movie? Really cute outfits! My fav would be the Loft dress, it's so chic and girly. I love the details as well. Such cute outfits and shoes! Love the pattern of the high-low skirt. thanks for sharing.